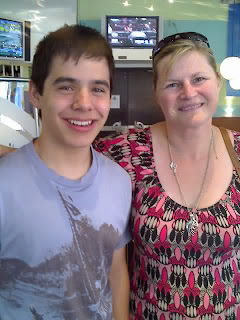 Meet 'American Idol's' David Archuleta with my dear friend, Anne at Fran's in Toronto. Hmm...I wonder if he had the grilled cheese, or a chocolate milkshake? Thanks for you observations! David is a fabulous guy...let me warn you, ther's no turning back now once you've got the bug:) I have 2 college age kids, never listened to the type of music David performs, but he is special. Can't put it into words..But I hope he is around for a long time. I may just love this kid!!! I'm a big fan of David - and like many have noted in your other post - i'm not a tween. So glad you are supporting Archie and his career. Even though he was my favorite, I'm actually glad he lost. Cook is a good role model and big brother, plus the big pressure is off Archie's shoulders. I can't wait to see this kid grow up and make music! You can definitely count me in as a fan. I was quite disappointed not to see any news reports this evening on the Toronto concert. The industry needs more genuinely nice people like David. I hope he can stay grounded but from what I've read about him, if anyone can, he can. His family sound like a wonderful influence. I agree with Eileen - it will probably do him good to be the runner-up, not the overall winner. The pressure will not be so heavy on him. No doubt he will be around for a very long time.